 Surface is easily washed with soap and water. 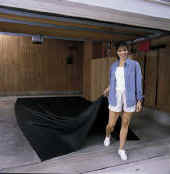 Product can be easily washed off inside or outside of garage. Brush or sweep with cool water using a broom or sponge squeegee. Mild soaps and normal household detergents may be used. Do not leave harsh detergents or chemicals on product or wash into sewer system. Some people prefer moving the product outside and hosing it off.  Normal household vinyl cleaners may be used to increase longevity and to remove stubborn debris. Certain automotive vinyl products may cause surface to become slippery. Use a non-slip vinyl protector such as a clean-and-shine floor cleaner.  This is not a stain-proof productcertain dyes, inks, rubber tires, and chemicals may cause permanent staining. Some of our customers have reported that spray-on Brake and Tool Cleaner, found in many auto parts stores, will remove some stubborn stains without damaging the product. However, use of brake and tool cleaner may cause product discoloration. Never use harsh chemicals such as tar remover or kerosene on this product.  After cleaning, apply a coat of floor polish for vinyl floors to add a long-lasting, high-luster finish, even to older garage floor protectors. NOTE: Leaving chemicals on the product for a long period of time may cause damage. If concrete floor has been treated with certain sealers prior to mat installation, sealer may break down over time and adhere to back of mat without causing damage to mat. Some motorcycle kickstands may cut or damage this product. Any floor surface can become slippery in the presence of moisture and debris. Proper care and cleaning of vinyl flooring will reduce the likelihood of slips and falls. Wipe up any oil, chemicals, or other fluids that may drip or leak from vehicle to prevent hazardous, slippery conditions. Always dispose of hazardous materials properly.